But when you're internally motivated, you're driven by a desire to make yourself better. You're only accountable to you, and that means you control the variables that decide whether you succeed or fail. When those factors are stacked in your favor, the odds say you'll make lasting change. On my running routes, there are a few folks -- the regulars -- I can always count on seeing. We don't know each other, but we wave and say "hi." I like to add, "Enjoy the run!" for good measure. "Thanks, I always do!" is a typical reply. I was talking to a friend about exercise recently and how it can be so hard to get yourself into any kind of rhythm that fits into a productive routine. You want to take care of your body and feel your best, but it's damn hard to make the time in your busy life. Or you try a few routines and you just don't like them; they don't work for you. That's not just a formality. We really do enjoy running. And the reason we enjoy it is highly dependent on where our motivation to run comes from. If you've ever struggled to stick to a fitness plan -- or any plan, really -- the solution could be as simple as channeling your motivation from the right source. Here's how to do it. Talk to someone who works with drug rehab patients, and you'll hear the same wisdom shared over and over: "Success depends on your motivations." They can instantly tell if their patient will get clean and stay that way. Everyone who overcomes a drug addiction is motivated, but the ones who succeed long-term are the ones who are motivated for the right reasons. 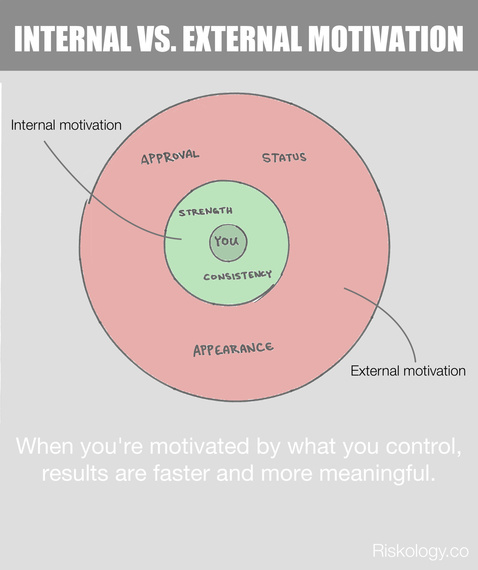 That example illustrates the difference between internal and external motivation. When you're externally motivated to make a change, the things that drive that change are outside of you and your control. For an addict in rehab, it could be the loss of a relationship, a job, or something else. For you, trying to get in shape, it could be keeping your partner attracted to you, finding a mate, or impressing friends and colleagues. All the data say if these are the reasons you do what you do, it probably won't last. External factors change, you can't control them, and trying to keep up with them proves useless over time. Let's face it. We're all externally motivated to some degree. But if you struggle to build an exercise routine that will become a part of your life and produce the lasting results you hope for, the trick is in tilting the scale just a little -- finding the internal motivations that will produce those external results. Only do exercise you enjoy. Don't feel pressured to do any specific routine just because you think it will produce results faster. Any gains you do get will be lost when you give up because you don't like it. If you like running, then do a lot of running. If you hate lifting weights, don't lift any weights. When you try something new, don't give up for at least 30 days. When I started running, I didn't like it that much, to be honest. I was overweight, out of shape, and not very good at it. But I wanted to give it a fair trial, so I stuck with it for a few months. Nearly 1,000 runs later, it's one of my favorite activities. Don't give up on something because you're not good at it. Your skill will improve with time, and you're more likely to enjoy the things you're good at. These are the primary factors in building an exercise routine that is a natural part of your life instead of one you struggle to implement over and over. When you let your internal motivations guide you, the results you get won't just be better, they'll be more fulfilling.